After a decade of sleek, polished looks, home trends are embracing the artisan. Ironmongery, you could say, is having a moment. Like all crafts, its beginnings are ancient. Mankind first started working with metal in Ireland about 2500 BC, more than 4,500 years ago. “In our modern age, when a hard day’s work rarely takes a physical toil, there is a true romanticism around that art of metalwork,” says Colm Bagnall, a maverick, who with his partner Edward Bisgood, set up one Bushy Park Ironworks in 1990 and in doing so brought the craft out of the dark ages and into a new modernist era with its large scale gatework, railings and statement staircases. The firm has also worked on some of the country’s finest buildings; Powerscourt Estate, Leinster House and Christchurch Cathedral. Ironmongery was in vogue back then, from the late 1980s to the mid 1990s, and is now enjoying a revival thanks largely to fantasy shows like Game of Thrones which showcases its range from battle weaponry to dramatic lighting, braziers and torches, he explains. “This time round there’s a new breed or talent, that are part metal worker, part artist and not afraid of getting their hands dirty.” He attributes the increased interest to the fact that “most of us are no longer worn out by day’s toil and that many of us innately want to make something, to tame the elements, bending metals to our will, creating something from nothing.” Television shows like Forged in Fire tap into this and have created a cult of backyard blacksmiths, pretty much an American phenomenon where amateurs play with fire in their own sheds. In Ireland he calls these would-be apprentices “life-changers”. “They want to get away from the rat race, often as part of a mid-life crisis.” Bagnall’s all for introducing gifted souls to his métier but some are not up to it, he says, and he has to let them down pretty quick. 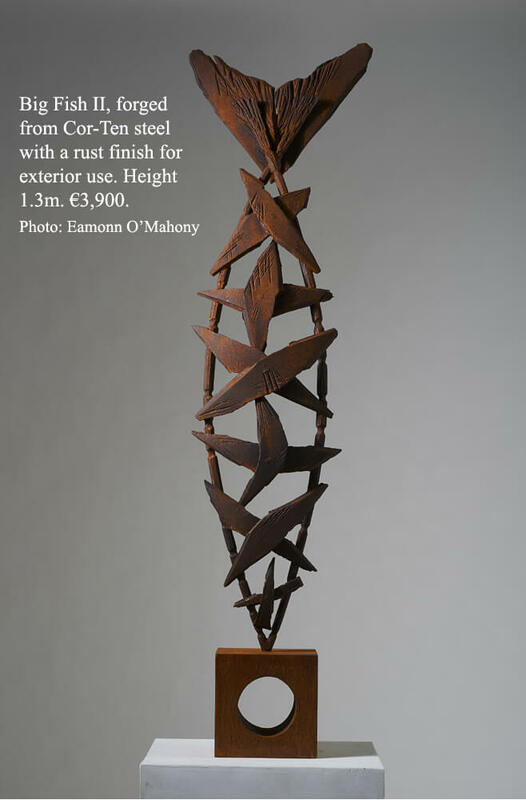 “It is a bit of baptism of fire,” explains Jane Murtagh, who won the metalwork category of the RDS Crafts Awards last summer and works mainly in copper, on smaller wall-hung decorative pieces, one of the most talented women in what is still considered a manly tradition. “You’re bringing a cold slab of metal to life and turning it into something soft and moving.” She got her fine art training at art college in the 1970s but as a child she used to run errands for her father who had an antiques shop on Dawson Street collecting Georgian silver repairs from Alwright & Marshall. It was a formative experience for when she first walked into the studio in college. “The smell and the sound of it, the dust, the torch, all felt familiar and right”. Her work includes a €1,100 single leaf gunnera, the wild giant rhubarb that you see colonising large tracts of the west of Ireland, that you can hang on the wall. 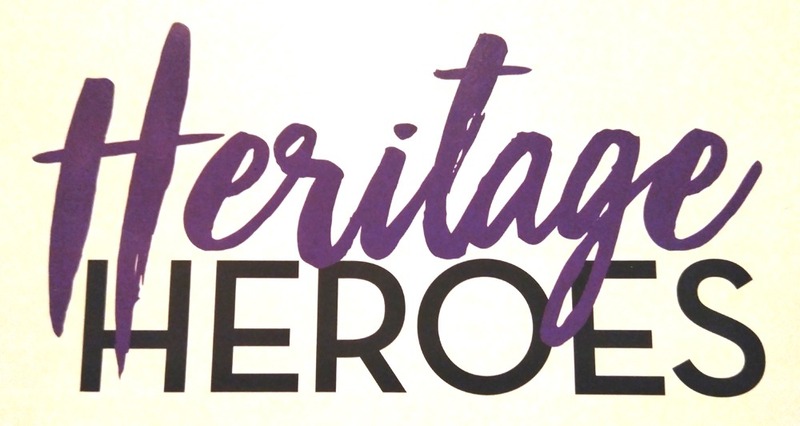 Dane Gunvor Anhøj was interested in the traditional aspects when she got her first taste of its power volunteering at a local museum in Denmark. “It was full of old men,” she recalls and having met her now husband, Michael Calnan, at college in Hereford, they set up in business together at Russborough House in Co Wicklow, because his parents lived nearby. Michael Calnan can be seen every Wednesday at 6pm on RTÉ’s reflective angelus slot, which precedes the news, forging a rose, incidentally a lovely Valentine’s present that you can buy in iron for €150 or in bronze for €320. However, it was as a result of exhibiting at the Chelsea Flower Show in the early noughties that their work evolved into the garden sculpture and water features that they are now known for. Their metre-high Corten steel hare costs €5,900 while water features in bronze and copper cost from €3,000. Fire screens and other period home furnishings start at around €2,000. Calnan & Anhoj gallery showroom at Russborough is open from March 1st, while their work is also sold at Kenmare-based Mill Cove Gallery or The Kildare Gallery at Carton House, Maynooth. His work is mainly architectural ironmongery; staircase balustrades, fire baskets and restoration of traditional work on historic buildings. Keeling recently completed the murder hole grille at Blarney Castle and his lighting can be seen in the chapel in Swords Castle where three of his chandeliers hang from the ceiling. A two-tier design with a brass pyre vessel that hangs above the alter would set you back about €20,000. He also designs entrance gates which start from €35,000. A brazier will cost from €2,200. While John Hogan of Killala-based Iron Excellence excelled at woodwork in school it was only after school that he “took a chance” on a course in nearby Belmullet in his native Co Mayo. From there he went to Bushy Park Ironworks, creating gates for Birr Castle and railings for Trinity College. “A lot of people want to get away from the term blacksmith as it is associated with a man working in a small shed with a horse,” he says. “But modern forgework is more sculptural than that.” His work includes minimalist railings for private houses and parks like the Admiral Brown Park in Foxford, Co Mayo and the seafront in Enniscrone, Co Sligo as well as staircases of all sorts. Prices for the latter start from about €5,000 for a simple, straight, one-storey banister and handrail, up to €25,000 for a curved and highly decorative structure. While designers are making new work, the rise in popularity is mainly due to restoration work, explains Bagnall. “The number of people who want it done properly is increasing and this also leads to new design work coming through.” Do you need brawn to be successful? “I wouldn’t put it down to strength. You need to think some too. Certain parts of you do get knocked into shape – you may end up with big shoulders and small legs, but if it’s fitness you’re after you need to get out and run too he says. Blacksmiths in Ireland: Bushyparkironworks.com; calnan-anhoj.ie; janemurtagh.com; markkeelingblacksmith.com; ironexcellence.ie; Irishblacksmiths.com; maartenbaas.com; basedupon.com. 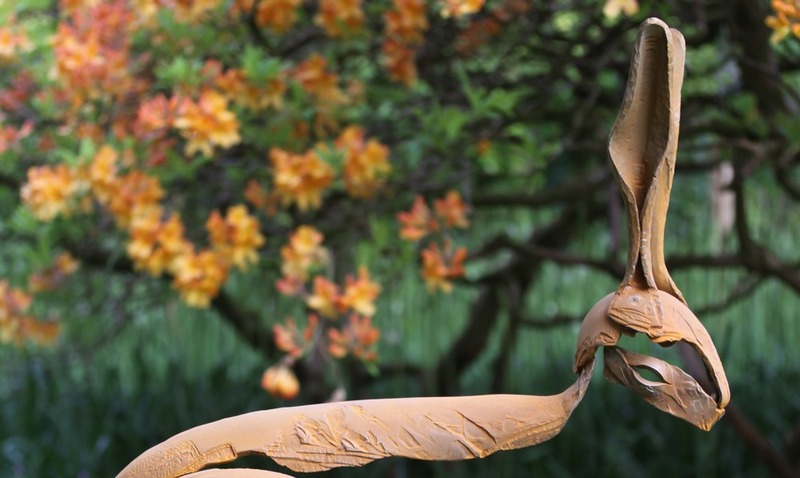 Is your idea of the perfect piece of garden art something along the lines of a classic bronze sculpture? Or do you prefer the idea of something slightly more kooky (some might say kitsch) like a vintage cast-iron garden gnome? Maybe you dream of turning your lawn into your very own contemporary landform sculpture a la the British artist Charles Jencks? Or enlivening it with a giant mobile in the style of the American kinetic artist Alexander Calder? Whatever your personal preference, the truth is that outdoor art should have a place in almost every garden, no matter what its size. Chosen with care and positioned with thought, even the most humble piece has the ability to add atmosphere, personality, charm and even an element of humour, to invite conversation and to serve as a handsome focal point. The best can also create a sense of place, magically echo the contours and colours of the wider landscape and bring out the best in any planting scheme by using it as a leafy foil while providing the perfect contrast of texture and form..
Another example is Crux, the travelling exhibition of five Irish-based artist metalsmiths including Danish-born Gunvor Anhoj, Michael Calnan, John Hogan, Jane Murtagh and Moss Gaynor exhibiting at Siamsa Tire, the National Folk Theatre in Tralee, Co Kerry next month (siamsaatire.com, 2nd-27th October) . Outdoor sculpture parks or public gardens to visit include the remarkable Lough Boora Park in Tullamore, County Offaly, the Irish Museum of Modern Art (imma.com), Kildare Gallery at Carton House in Co Kildare, Lismore Castle in Co Waterford (lismorecastlegardens.com), and the family-run Burtown House in Co Kildare (burtownhouse.ie ). Mill Cove Galleries Sculpture Garden in dest Cork, Shekina Sculpture Garden in Kirikee, near Glenmalure Valley in Co Wicklow (shekinasculpturegarden.com) and the Ewe Sculpture Garden in west Cork (theewe.com) are a few more to put on the list. One of the most respected and longest established Irish galleries specialising in sculpture is the Solomon Gallery, now based in Dublin’s Westbury Mall and owned/run by Tara Murphy (solomonfineart.ie). Work by a younger, less established artist is inevitably going to be far more affordable than one by an artist with an international reputation, while the size of the work and the medium/material being used – bronze, steel, stone, glass and wood are all examples – will also have a significant bearing on the final cost. Prices for work included in the aforementioned Sculpture in Context exhibition, for example, start at a very modest €25 for a glass/ceramic piece by artist Gwyn Grace while some of the large bronze/steel sculptures are between €10,00- €15,000. But in between these two extremes is a lot of reasonably priced work by a range of Irish-based artists. Killian Schurmann: Dublin-based Schurmann is a glass artist and sculptor producing three-dimensional pieces and fused glass panels. Imogen Stuart: (imogenstuart.com) A highly respected sculptor, German-born 90-year-old Stuart works in a wide variety of media in what she describes as her signature style of narrative sculpture. Sometimes, revived traditions are in reaction to a fast-changing world. Other times, they’re simply a labour of love. We meet the new faces of old-school art and crafts. Might heritage crafts be just a little musty, dusty and dull? Not a bit, as there’s a new wave of makers in Ireland shaking up what once might have been considered redundant crafts. From iron work to hand painted signs, its about thinking anew and getting physical with materials while adding a contemporary twist to age-old skills. 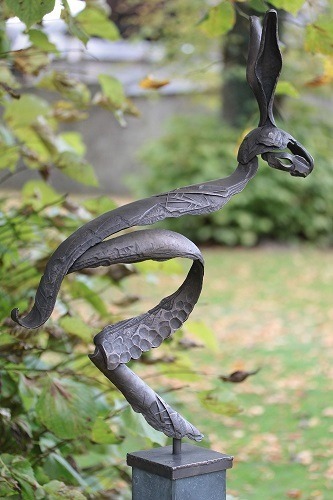 Denmark-born Gunvor Anhøj, met her creative partner and husband Michael Calnan when they were both studying blacksmithing at Hereford in the UK, which means even if it was a match made in heaven, it was also forged in fire and iron. Anhøj herself discovered the craft after studying horticulture and needing to repair an old iron plough tip. 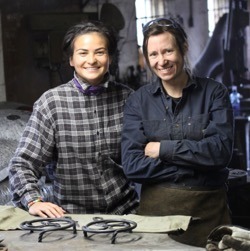 “Being a contemporary blacksmith demands an equal mix of intuitive, creative and physical abilities,” she says. “So it’s very satisfying.” She’s absolutely passionate about her materials and the process. “I work best if I’m allowed design intuitively at the forge – drawing on paper never did it for me.” The pair share studio space (calnan-anhoj.ie), but tend to design and make their own work. An exception being a piece made together, which was presented to senator George Mitchell in 2016 as part of the New York City St Patrick’s Day Parade, which Anhøj describes as her “most proud moment”. The duo’s work is expressive and exciting, making the metal flow, and then freeze into sculptural shapes. Describing her medium, Anhøj quotes her hero, American artist Beverly Pepper, who said: “People don’t think iron can be poetic, but even a human tear has iron in it”. Take five noted practicing craft and design artists, each individually recognized for their creative skills and master craftsmanship in all things metal art, combine the product of their individual hand-crafted toil into one overall collection and the result is some of the finest contemporary art metalsmith work to be found in Ireland today gathered under one roof in an engaging exhibition entitled CRUX – A Dialogue in Metal. The lively variety of artistic styles on display is one of the strengths of this exhibition – an artistic dialogue created when contrasts of simple plain surface shape is juxtaposed alongside detailed intricate refinement; of when beautiful natural sweeping curves are seen side by side with intricate decorated adornments; of the dialogue of etched pattern and sculptured hard edges, contrasted with earthen hues and subtle outlines of low surface relief impressions. All this dialogue is subject to change in form dependent on the perspective of the viewer and the ambient light that surrounds each art piece at any given time. This exhibition gives a small sample of, and celebrates some of the wonderful work of talented artist metalsmiths whose contribution to their craft in Ireland has been significant in both scale and in impact. When you look at and study the creative work of Gunvor Anhøj, Michael Calnan, Moss Gaynor, John Hogan and Jane Murtagh you understand that you are looking upon a body of work that is of international quality; you feel that each piece would not be out of place in the contemporary galleries and art houses of Europe and beyond. Indeed these artist metalsmiths have in their own right previously won international awards for their work, and have had their work purchased and displayed in collections in and beyond Ireland on a number of occasions. The five share a passion for their art and they have all contributed to the legacy of the metalsmithing craft in Ireland by providing, at different times and in different ways, opportunities for others to learn through teaching, mentoring and the sharing of skills in their craft, so that the art form continues to be practiced, and to be of cultural importance in Ireland today and into the future. On an ongoing basis and formed through time, are a multitude of factors which have previously shaped and continue to influence these five artist metalsmiths as they go about the active dynamic of creating new works. Across Ireland the various local habitats and cultures of counties Clare, Cork, Mayo and Wicklow and surrounding regions all come to bear influence upon each as they work hard to complete each new art-work, developed to meet the needs of their own high design standards, whether the piece is to be exhibited as part of a solo show, or to be completed as a commissioned bespoke piece according to the set specification of an eagerly awaiting customer. Metal is by no means the easiest of materials to master but it has attracted many an artisan throughout time, whose hands and imaginations have been drawn to the craft of trying to see how they could transform the material into an object of function, into some form of creative art, or into a combination of both. As far back as 8,700 BC, metal pendants from the Middle East in Asia were made, and in circa 2,000 BC, metalworking was gradually introduced to Ireland during the Bronze Age when functional objects such as cooking pots, axes, shields and other hunting tools became more widespread. Since these earliest days metalsmiths in Ireland have been looking at ways to develop and hone their skills, to seek to master their material, to mould and impress their own identity upon the object. Ireland is fortunate enough today to have a number of high quality contemporary artist metalsmiths in various parts of the country, all working quietly and endeavouring to master their trade. Seen here for the first time combined into one unique exhibition, these five masters of the art have applied the various skills of their trade – traditional skills such as that of smelting, forging, producing malleable metal which they have then cut, formed, joined, bent, gilded, sculpted, and then they have used their vast array of historical, studied knowledge and expertise to design shapes and forms finished with various other materials, to produce objects of quality and form, simple and intricate, large and small, two and three dimensional. As you walk around this exhibition CRUX – A Dialogue in Metal, take your time to look closely and fully appreciate the elegance and beauty of metal on show, each individual piece on display in its own right an individually handcrafted work of art, yet all together combined to create a rich visual display of what is possible when art and craft design succeeds in the hands of those talented enough to transform base metal material into something new and imaginative. The combined efforts of Gunvor Anhøj, Michael Calnan, Moss Gaynor, John Hogan and Jane Murtagh are to be applauded for they have shown that through the achievement of a successful collaborative venture, when artists combine and work to achieve a common goal, the outcomes of collaboration yield gains which can be easy to see. Here together in a language of art and craft design these five artist metalsmiths tell us a story through their exhibited work and it is a story, with their continued effort and artistic passion, that will no doubt continue to unfold tomorrow and into future years, playing an important part in Ireland’s changing rich cultural heritage into 2020 and beyond. I am originally Danish but studied in England achieving a HND in Three Dimensional Design Crafts / Blacksmithing at the Hereford College of Art and Design in 2001. This is also where I met my husband Michael Calnan – an Irish blacksmith graduate from the same year – together we set up the company Calnan & Anhoj. Our first studio was situated in historic surroundings of the Victorian ‘Llanthony Warehouse’ at the Gloucester Docks. Business start-up is never easy, but having a design / crafts based business in England at the time proved good. We were exhibiting at a number of Cotswold galleries and at the RHS Chelsea Flower Show. We also established relationships with private clients some of whom have continued to work with us since we moved to Ireland in 2009. What’s a typical work day like for you? Our current studio is based on the grounds of Russborough House, Co. Wicklow. We also live on the grounds, so after sending the kids off to school, the day starts with a walk to the forge along ‘the longest facade in Ireland’. As Russborough also holds a most spectacular view of Wicklow’s rugged mountains, commutes don’t come nicer than that! Once at the forge, I start out lighting up the coke hearth. It takes about half an hour to get ready, so that’s a good time to sketch or plan the days work. Typically the making process is split between the use of traditional and contemporary techniques. The best days involve time at the hearth, hand forging or using the power-hammer (a 1950’s machine for industrial smithing) As we mainly create sculptural work and one-off commissions, each piece is typically very labour intensive. We have a little gallery set up next to the forge and have rigged up a bell-pull for customers to ‘ring for service’ – a welcome break! Tell us about a recent project or design/ favourite project or design you have worked on? Last year (2016) we were approached by the New York City Saint Patrick Day Foundation to create a sculpture to be presented annually at the parade gala dinner. Our contact was Christopher Hyland, a highly successful New York based textile merchant (who is also a designer, writer and politician) and together we created ‘The Saint Patrick’. The piece portrays the essence of a swan through the use of carefully pared-down design elements, feather-like textures and attentive use of negative space. 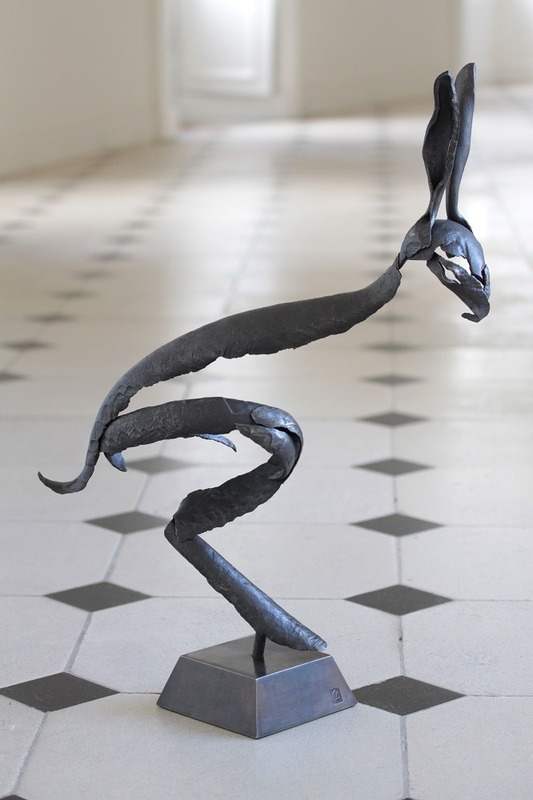 It was based on an existing sculpture of mine, a swan that had come about through ‘designing intuitively’ at the forge, using some found 50 year old tooling as a starting point for the initial design initiative. Alongside Michael and the client we refined the design and included the addition of 22-carat gold leaf. It was such a great honour to work on this project, not only will the swans be awarded to selected honorees every year from now on, it was the year in question of course – 2016 – that made it extra special. The recipients of ‘The Saint Patrick 2016’ which were titled ‘for Peace in Ireland’ included those who played a significant role in the Irish peace process. Parade Grand Marshal Senator George J. Mitchell, as Chairman of the peace negotiations which led to the Good Friday Agreement and also congressman Bruce Morrison, Niall O’Dowd, Brian O ‘Dwyer, Charles (‘Chuck’) Feeney, Christopher Hyland, William J. Flynn, John Fitzsimons. It was fantastic to watch Senator George Mitchell receive the award (on-line from our couch!) His one being forged in solid bronze was extra weighty – but he managed to carry it gracefully – and we got a hand written thank you note from him in the post later which is much treasured. I aim for designs that have visual impact through an equal blend of shape and surface. Rustic textures in elegant form is my ‘signature style’. I like to compose a piece using as few components as possible and also try to assemble them in a way that suggests a playful creation. A lot of intent goes into capturing a style which appears accidental or playful! There is always a fine line between expressing the initial idea versus dulling it down by over-thinking or over-working it. Forging metals versus casting them, facilitates a short moment in the making process where the material – through heat – is at its most malleable and whatever tool impacts the surface at this time makes a permanent impression. This creates a sort of ‘impact texture’ which captures the unrefined earthiness of the raw material. I get my inspiration randomly and find it easiest to design when I’m not supposed to be creative, being a passenger in a car for example is a good one. Having lived half of my life in Scandinavia, I’m sure my aesthetics are influenced by Danish design. Designing and creating is like summing up what you like and what you want to say on a daily basis, sort of leaving your mark on the world. What’s your most treasured possession? I have my grandfathers vintage Bézard compass and I have always loved it as his name ‘H. Christensen’ is embossed into it. He was a bit of a pioneer and a business man on the west-coast of Denmark where he had an engineering company which I loved to visit as a kid with all its machines and smells of metals. I have brought this compass with me on some of my unusual journeys such as when I walked from one end of Denmark to the other on a sort of pilgrimage and also when I traveled on my old Enfield motorbike to attend blacksmithing college in England. I actually don’t know how to use the compass but that isn’t the point! Who would be your favourite designer, or style inspiration? What would be a dream project for you to work on? A CHAMPION CHESS PLAYER, A MECHANIC, A PILOT, A BOXER, A BLACKSMITH, AN ELECTRICIAN, A PILOT, A FIRE FIGHTER, A WRITER, A SCIENTIST, A RALLY DRIVER, A FARMER, A PERCUSSIONIST, AN UNDERTAKER. A Woman’s Work is series of beautiful portraits of strong and inspirational women. Captured at work, they challenge expectations of their place in the world. They are role models in every sense. ‘A Woman’s Work’ started out as a set of eighteen portraits of beautiful, imaginative and strong women in creative and unusual, predominantly male professions. Photographer Beta Bajgart has extended the collection into a beautiful coffee table book that was launched by The Tánaiste Frances Fitzgerald on 8th March 2017 in the Dublin Castle. Proceeds from the book are going to charities. Words by Jennifer Davidson. Beta works as a commercial photographer but in her personal photography projects, she is more interested in people and their stories. A Woman’s Work is a testament to brave women who are following their dreams. Some changed paths and some had to adjust to new circumstances and change profession. They all have one thing in common: they are truly inspiring. This series of photographs documents the modern woman’s struggle to fully embrace their creative and professional passions. 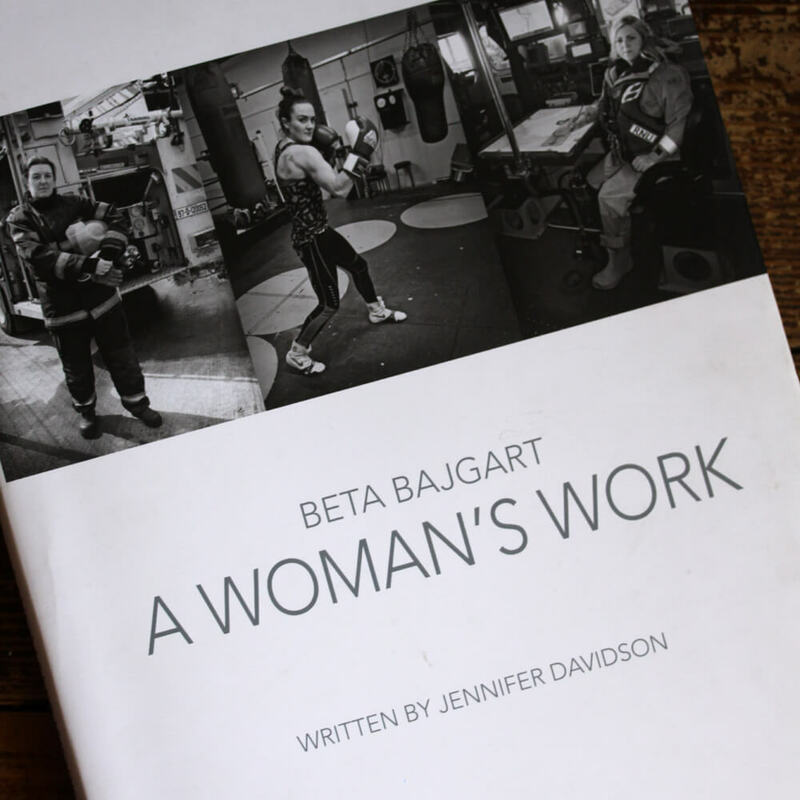 With this project Beta hopes that younger girls will view the women photographed in this collection as role models. And for all women, no matter what age, to be inspired by these dynamic, strong women to cherish their own strength. It is never too late to make a change. Since the CEO at Russborough House in Co Wicklow invited artisans to take up residence on the grounds, the arrangement has helped breathe life into the estate, and provide these creatives with a supportive community to develop their craft. It is an issue that the number of historic Irish attractions around the country must address: how to generate attention beyond heritage alone. Establishments like Russborough House need to get people in the door while staying true to the character. While some have turned to hosting festivals and adventure activities on site, which of course require huge investment, CEO of Russborough Eric Blatchford has chosen to build on the artistic history of the estate. “When I started as CEO eight years ago, all you could do here was a tour of the house. Russborough is known for its art and architecture, and these outbuildings were in a rundown state, absolute ramshackle. Creating a craft village was a way to marry that,” Eric says. Historically, the outbuildings would have housed the blacksmith’s forge and other craftspeople necessary to the running of the estate, and this gave Eric the idea to offer residencies to artisans. “There were three reasons to do it. First, so the buildings would be occupied and maintained; second, to broaden the strategy of Russborough House; and third, to generate another piece of income, as we are a not-for-profit organisation and the artisans pay us a low rent,” Eric says. The artisans, husband-and-wife blacksmiths, stone mason, ceramicist, weaver, candle-maker, artist, wood turner and wood sculptor, each have their own designated premises in renovated stables and sheds, facing on to a shared courtyard just a short walk from the main house. They have workshop and display space, so they can work throughout the day and greet visitors as they wander in. The traffic at Russborough has increased exponentially since the CEO Eric began to diversify the estate. The mutual benefit for tourism destinations like Russborough to link with Ireland’s artistic community is profound, and certainly an idea that could be successfully replicated. “I think every country should have a craft hub, from a tourist point of view. People will be more willing to travel to these destinations around the country, and it can only add to an attraction,” Eric the stonemason says. Eleanor Flegg examines Peter Rowen’s Portraits of Irish designer-makers at work, currently on view at Dublin Airport to celebrate ID2015. Work, in its wider aspect, is the central theme of ‘Design Island’, a photograpic exhibition by Peter Rowen at Dublin Airport. The images show people making things: Philip Cushen teases strands of woll; Ian Walton inspects a watch. Various in their perspectives, the photographs share a sense of concentration. The act of work is an absorbing one. It requires focus. Rowen’s photographs were taken in workshops and studios around the country; there are 300 in all, printed in large format and strategically placed throughout both Terminal 1 and Terminal 2. The project is part of the programme for Ireland’s Year of Design, ID2015, an initiative of the Design and Crafts Council of Ireland and funded by the Department of Jobs, Enterprise and Innovation, the Department of Foreign Affairs and Trade, and Enterprise Ireland. It’s worth keeping this stream of funding in mind. ID2015 often appears in fancy clothes – it’s a design event after all – but it’s objective is the creation of jobs. In this context, Design Island can be seen as part of the process that supports an industry by creating a narrative around it. And the story, in this instance, is The Elves and the Shoemaker (worthy tradition is boosted by new magic, the rich man gets his shoes, and everyone is rewarded). The subjects were chosen to reveal the length and breadth of design in Ireland. They include large businesses and one-man-shows, famous designers and students, traditional crafts, industrial manufacture, emerging technologies, and disciplines like engineering that are rarely considered under design’s wide umbrella. Some of the images, like those of Cushendale Woollen Mills abd Jerpoint Glass, predate the project. Others have not been seen before. The colour photographs of the original brief are interspersed, at Rowen’s suggestion, with images in black and white. They create a sense of timelessness, reminiscent of David Shaw Smith’s Hands series for RTE which helps to bridge the old and new traditions. Their placing in Dublin Airport, where they replace Kevin Abosch’s Faces of Ireland (2011), is crucial to their impact. Unlike a white cube gallery, designed to limit exterior stimuli, the airport is a venue laden with baggage. Arrival and departure are emotive concepts. The corridors that facilitate airport travel are liminal spaces; places where weariness or excitement may tear a hole in the defences that we place between ourselves and the world. As advertisers and tourist agencies have long been aware, there are moments in the most ordinary journey when a country may be bought or sold. In 2015, many of the heightened emotions felt at Dublin Airport may be to do with work, or the lack of it, in Ireland. It’s a sensitive topic, and one that is one many people’s minds. ‘ Unemployment is one symptom of the deep imaginative failure of modern society,’ wrote Roger Coleman in the depths of 1980s recession. ‘Before we can put people back to work we have to rethink what we mean by work and how that affects the details of our lives. We have to put creativity, imagination, innovation and invention back to work and back into work, and to do that we have to start somewhere.’ The process of economic recovery requires healing, at some societal level, of what we might imagine our lives to be, and the creation of a positive narrative around work is part of the process. Design Island, is art in the service of a society pulling itself up by its bootstraps. The journey, in every sense, is a long one. 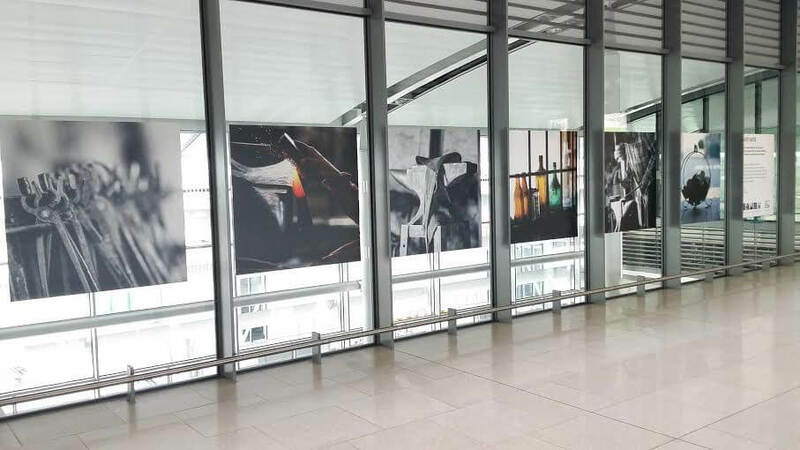 On arriving at Terminal 2 one travels a corridor approximately the length of O’Connell Street, and this is punctuated by images in groups of six or four, each series related to a particular design business. Some are portraits; others are unselfconscious moments in the working day. A worker is caught staring into the distance, elbow propped, the white wires of earphones coming from his ears. The planks on which he leans are neither raw material nor finished object, although they are on their way to becoming a piece of furniture from the studio of Joseph Walsh. Although Walsh himself was photographed, his portrait is placed elsewhere and the series of images relating to his workshop do not show the designer-as-hero. Kenta Hirai, the man with the earphones, is an employee in Walsh’s Riverstick studio. It’s a refreshing counterpoint to the types of design writing that focuses on the celebrity designer with no indication that design is an iterative process. In the same way, Rowen’s photographs of objects are often captured in their half-formed state, embryonic things in a moment of manufacture: an unfinished drawing, an abandoned pencil, a skein of wool or a lump of clay. Often the object itself offers few clues as to what it will become. Sometimes the images focus on the means of production, the dignified machinery of textile production or, in smaller enterprises, the tools of the trade. The focus, on either case, is on the process rather than the product, on design as a activity rather than an outcome. Rowen, who considers himself a commercial photographer, took a pragmatic approach. ‘I had three hours with each of the studios,’ he says. ‘I went out there and did my best. I hadn’t realised that there was so much design activity around the country and that people were making things to such a high standard in Ireland. It’s the story that makes the photographs.’ Much of the effectiveness of the exhibition depends on Rowen’s considerable ability to capture unguarded moments. His backstage images of London Fashion Week, in which the models are revealed as thin, exhausted, possibly exploited, children are deeply poignant. So too are many of his wedding photographs (the mother of the bride pours a drink of water from a tap; the best man knots the groom’s tie). You imagine that these are the images that a client might be grateful for in the long run. Rowen also does centre stage. He has photographed U2 on tour on several occasions and one of his photographs became the cover of their live album U22: A 22 Track Live Collection from U2360 (2012), but his backstage images, which catch the band in rare moments of unselfconsciousness may be the ones that stand the test of time. His history with U2 goes back to his appearance on the cover of Boy (1980) and – grown and glowering – on War (1983). His brother is Guggi, artist and former Virgin Prune. ‘There are ten of us in the family,’ he comments, ‘and none of us has ever had a proper job.’ His sensitivity to work, in its wider and deeper sense, may be something to do with this. Rowen has been photographed with U2 by Anton Corbijn, who he cites as one of his influences, particularly for the simplicity of his approach. ‘I love the idea of going to a job with one lens, one camera, simplifying the whole process. When I went around the studios for this project some of the people weren’t particularly comfortable being photographed in these situations at all. If you keep it simple you get a better result. The more people you show up with on a shoot the more intimidated people feel.’ For this reason, the Design Island project was undertaken without an assistant, using available light. Although this was an expedient choice, the plainness of the lighting adds something to the photographs. less contrived than studio shots, they carry a sense that significant moments may often be the ones that we are unaware of at the time. Artisans Forge Ahead. The Sunday Times. 22.11.2015. Revived interest in authentic, hand-made products means ancient trades are in demand. Tony Clayton-Lea meets a blacksmith, cooper and a cobbler who have learnt the craft of job satisfaction. ‘Everything seems to be about clever machines these days. In the not too distant future it may be possible to download anything from your breakfast to a pair of shoes and print it off from a gizmo in your kitchen where the microwave used to be. (…extract of article:) Having a sound business sense is something that crafts people consistently need to develop, according to blacksmith Gunvor Anhoj. 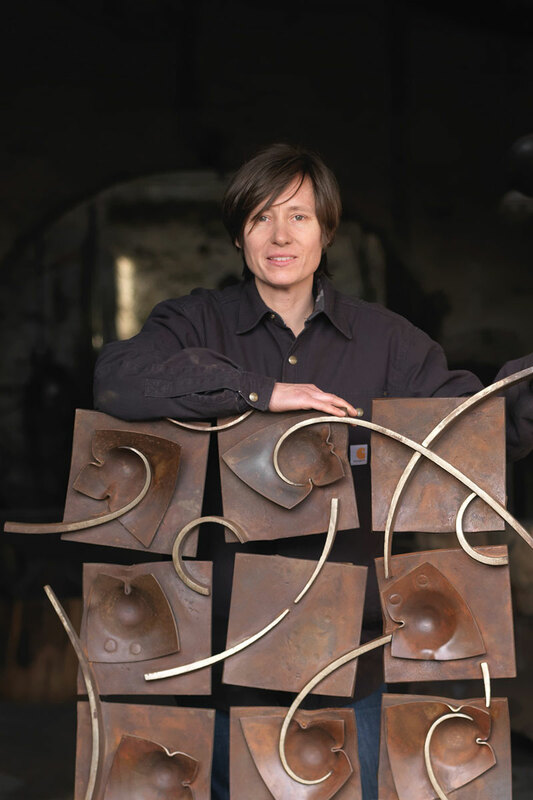 The 42-year-old Dane and her Irish husband, Michael Calnan have been producing utilitarian and sculptural metalwork from the forge near their home in Blessington, Co. Wicklow, since 2007 [and in the UK since 2001]. Anhoj agrees that what she does is more of a vocation than a job, yet she occasionally sees how idealism can short-circuit practicality. “I run courses on the craft, and I suspect sometimes that the idea of having your own forge attracts a type of dreamer who romanticises about changing their life and escaping the rat race – but it’s the opposite,” she says. “When you have a small business you have to be your own sales and marketing manager, social media expert, website designer, photographer, book keeper etc – and on top of that you have to have a production line, so to speak. “You’re making your main income from a craft that is extremely labour intensive. People picture a relaxed person in the middle of nowhere – hammer in hand… but its actually the other way around: you almost need an extra day in the week. Of course most self employed business owners would say the same. What my husband and I do is a traditional craft; everything is made from scratch, and that takes time. It is very much based on trial and error, which is possibly why even after years of doing it you still have to be completely tuned in, you’re still learning, you still have to put the hours in to develop an idea or a technique. 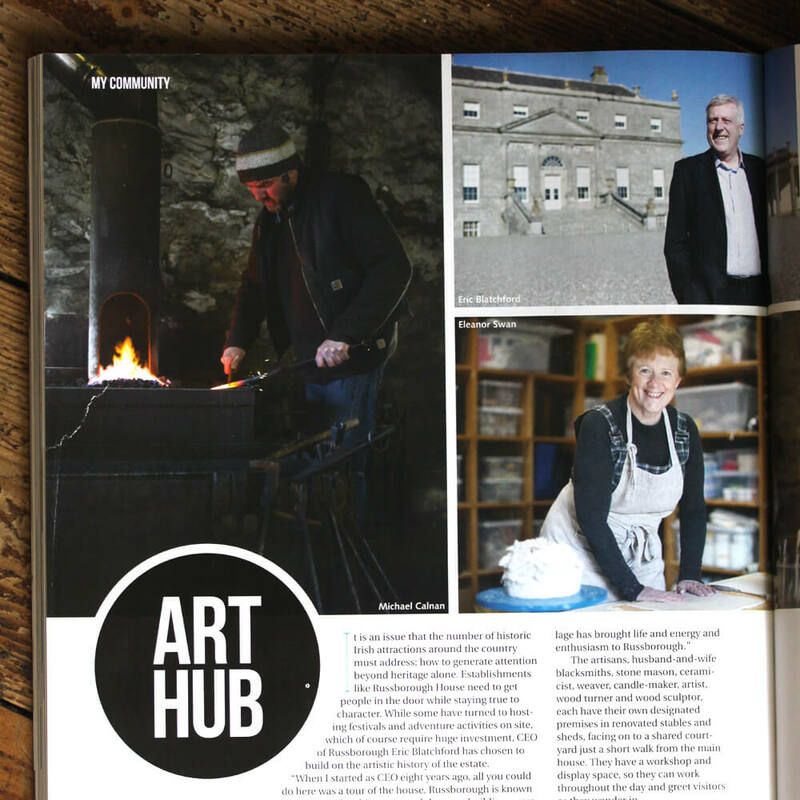 The Sunday Business Post Magazine – by Margaret O’Brien. Husband and wife team Michael Calnan and Gunvor Anhøj have forged a small business with a big reputation from iron, steel, bronze and copper. A native of Denmark, Gunvor Anhøj started a forging business in 2001 in England, while Michael Calnan’s background saw him working for Seattle-based glass artist Dale Chihuly. Since 2009, they have been based on the grounds of Russborough House in Blessington, Co.Wicklow, where they create sculpture that varies from elegant birdbaths, to boldly primitive fire braziers. “For the interior, we focus on the small sculptures as well as wedding gifts, and we also create awards,” says Anhøj. “We have made a range of period pieces for clients over the years such as bespoke door furniture, fire screens and lighting in steel, bronze and glass. Since we set up at Russborough House, our range has grown to include various hardware, some of which we invite people to ‘make yourself’ on our one- and two-day blacksmithing courses.” Their designs have changed over time. “We used to do a lot of abstract work, pieces that reflected a passion for the material more than the artistic content. Some of Michael’s pieces were monumental. Since arriving in Ireland, our pieces have been smaller in scale, and are largely inspired by what surrounds us.” When Gunvor made her first Venetian Hare, she recalls seeing hares regularly in and around the forge. Portraying the essence rather than the obvious, her pieces are delicate traceries of beautifully wrought metal forms, using as few components as possible to describe as much as possible. “We have our own distinctive style, but over the years we find ourselves increasingly borrowing ideas and concepts from each other!” she says. “We work separately on pieces, but help each other with advice. We have found a way to share the work space, we know when to keep quiet for example… we sympathise with each other’s blunders, and celebrate when things go right. We are a team in life, and our love for the craft is shared – we couldn’t do it without each other. Based on Sylvia Thompson’s widely read column for the Irish Times, this beautiful book celebrates the wealth of crafts practised and taught throughout Ireland. Hands On: The Art of Crafting in Ireland details the history of more than forty eclectic crafts, from basket making to woodturning, and provides concise information on where to see them, where to learn them and what’s involved. 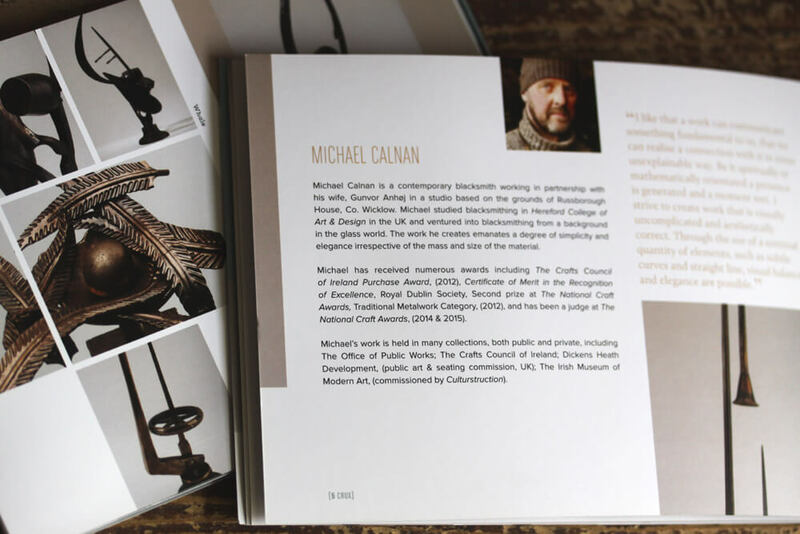 With over 150 images showcasing the extraordinary work of craftspeople from across Ireland, as well as insightful contributions from acclaimed writer, Jeanette Winterson and the Crafts Council of Ireland, Sylvia Thompson’s book is the first of its kind to offer a comprehensive guide to craft in Ireland. A lavishly illustrated volume containing everything you need to know about the traditional and innovative techniques involved in Irish craft, Hands On is sure to be an indispensable resource for beginners and experts alike. Bringing a garden to life 365 day a year, outdoor sculpture is a beautiful antidote to the unpredictability of the seasons. One of the great pleasures of a garden is the slow transformation it makes throughout the seasons. It is a sensory shift, as flowers grow fragrant and wither, and branches drift between budding and barren. One contemporary feature of a garden, however, remains constant. Amid the changing weather, a piece of sculpture brings colour and character to an otherwise transient scene. No longer the reserve of the elite, a new wave of creatives are crafting homegrown work that is both accessible and affordable. For husband-and-wife team Michael Calnan and Gunvor Anhøj, the appeal of outdoor metalwork is its ability ‘to tie in with the fabric of the house’. Known collectively as Calnan & Anhøj, their current studio is based in the splayed demesne of Russborough House. The duo create work that is dynamic and impressionistic, brilliantly disrupting the serene calm of an Irish garden. ‘The design process begins with a connection for expression, a sketch, and then the making of the full scale work’. Deliberately counteracting the traditional static of sculpture, they often integrate running water into their work, and each piece is designed to give ‘sound, movement and aesthetic to a garden’. For those unsure where to begin, Reen Farm is an inspiring example of a private garden-turned-gallery. When sculptor John Kelly first moved to West Cork, his wife Christina recognised the potential of the lush scene surrounding the farmhouse. ‘She turned to me one day and said she would really like to open the shutters in the morning and see sculpture in the garden’. Fourteen years later, Reen Farm is a fertile land of sculpture, hosting more than a dozen examples of John’s creative ingenuity. ‘The design process always starts with a drawing. From there on, there are many different approaches from bronze-casting to steel fabrication and laser cut-outs.’ In particular, his 1999 work entitled Cow Up A Tree, makes for a commanding silhouette along the ragged Reen Peninsula. A humorous piece depicting a realistic cow up a realistic tree, it is currently rooted opposite the crash and vigour of the Atlantic. ‘The costal elements bring ever-changing drama to the sculpture. I don’t think there is a better placement to be had, especially as we can enjoy it daily’. Along with a turn in the weather, this autumn will bring the annual Sculpture in Context exhibition to the national Botanic gardens once again. Unveiling the wealth of outdoor artwork that Ireland has to offer, prices begin at a modest €50 for small-scale pieces. Organiser Jackie Ball offers simple advice to first-time buyers. ‘While art is always a good investment, the best reason to buy any sculpture is because it would be a harmonious addition to your garden. Buy sculpture you love.’ With this sentiment in mind, it has never been easier to grow your own state-of-the-art garden.